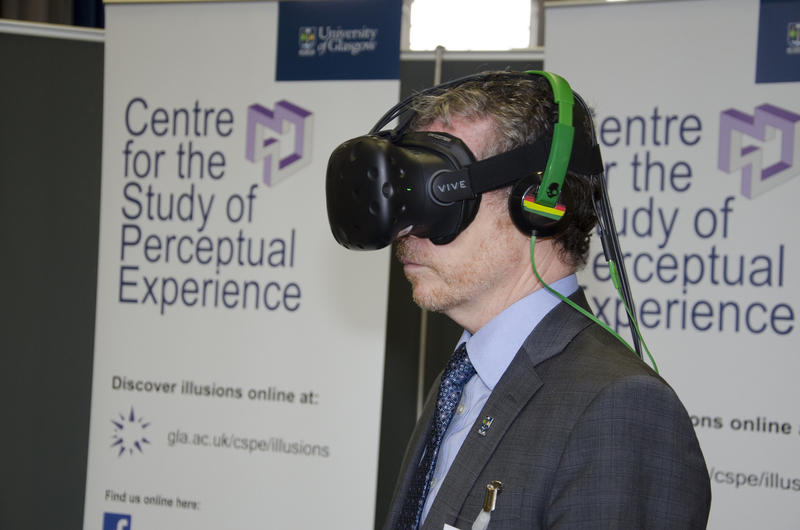 Professor of Philosophy Fiona Macpherson and research associate Neil McDonnell were awarded a grant of £15,000 from the University of Glasgow’s Knowledge Exchange Fund for an exciting new project on Virtual Reality and Augmented Reality (VRAR). The project ran between January and March of 2017. Before we get carried away with what sounds like science fiction, what does VRAR mean? Virtual reality intervenes on as many of your senses as possible to make you feel as though you are somewhere else in a different environment. Whereas augmented reality retains the normal world for the participant, but it brings in virtual elements, which, when created perfectly, should be indistinguishable from the real elements within our world. There is huge potential for the use of VRAR in education, with the digital native generation looking for greater connection and accessing of information than before. Across a number of disciplines VRAR can support academics to discover new worlds, reach distant locations, visualise data and understand micro and macro environments at human scale. In our experience it gives students the ability to immediately visualise and immerse themselves in the subject matter. As the director of the Centre for the Study of Perceptual Experience Macpherson was also keen to explore the potential of VRAR technology as a new seam of philosophical research. She said that philosophers of perception, like herself, are obsessed with what happens when our perception essentially ‘goes wrong.’ That’s part of what makes the potential of VRAR technology so fascinating, it can invent illusions and hallucinate a whole other world around you. The level of immersion the VRAR headsets offered was so convincing that during an experiment in which participants viewed themselves standing on a high cliff, very few were brave enough to take a step over the edge! VRAR technology could offer some amazing teaching experiences. For instance, some of the most incredible places in the world are sometimes the most dangerous and inaccessible. However, with the aid of virtual reality universities could cheaply and safely transport a whole class of students under the surface of the earth, or to the bottom of the ocean or into outer space to explore for themselves using these headsets. Macpherson and McDonnell also envisioned using the technology in Museum Studies to scan the physical space of a museum and its objects. Then VRAR technology could allow the student to become the curator by allowing them to arrange the museum’s artefacts in their own way. The possibilities of the virtually curated museum don’t end there either. Curators could employ the same technology to analyse visitors’ reactions to different layouts before embarking on an expensive and time consuming re-design. As far as philosophers such as Macpherson and McDonnell are concerned, perhaps the most interesting possibility is the opportunity to test ethical scenarios. Virtual reality could allow lecturers in Philosophy to place a student in a dilemma scenario with two possible responses which both have a cost. Then the teaching staff and students could interpret whether there is a gap between the way that an individual said they would act theoretically, and how they acted in the situation. That gap is very interesting to both philosophers and psychologists. However, Macpherson and McDonnell also recognised that the rapid rate of VRAR technology development also raises a series of metaphysical as well as ethical questions, including ‘is it real?’ Additionally, if the biggest investors in VRAR are organisations like Google and Facebook then they could also potentially control what is represented to us through such technology. The current concerns over the social media newsfeed bubble only relate to what is presented to us on screens, whereas control over VRAR technology could allow organisations to control elements in our world. That’s one of the reasons that researching and questioning such technological advances is so urgent and important. If you would like to find out more about the potential of VRAR technology for your organisation, research or teaching, or if you would benefit from a philosophical perspective on the ethical use of VRAR technology please contact us at arts-ke@glasgow.ac.uk.